The Friendly Toast at 1 Kendall Square on a summer day. As recently as a few years ago, nightlife in Kendall Square was a punchline. The streets went dark early, and were largely empty even in daytime. Employers came to Cambridge because they wanted to be close to other cutting-edge companies, and to MIT. They came in spite of the moribund neighborhood around them. The old, boring, dark Kendall Square is gone. The square today is teeming with interesting, eclectic restaurants, bakeries, and coffee shops. As absurd as it might have sounded a few years ago, Kendall is now a hot food destination. It’s buzzing with Cambridge’s residents, students, and tech workers. It’s drawing in diners from the suburbs. A place that lay fallow for so long has been transformed almost overnight. 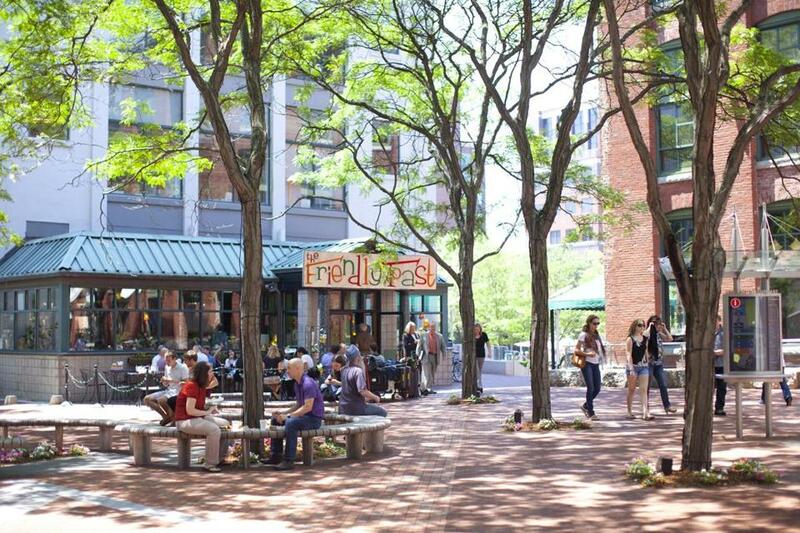 Small, local, independent businesses have been driving Kendall Square’s dramatic turnaround. That’s by design. As mega-developments in Boston’s Seaport, Somerville’s Assembly Square, and Quincy Center speed ahead, Kendall Square’s revitalization effort, which is dominated by funky independent retailers, stands out as an important test case. Real-estate firms used to dealing with bland chains are making money in Kendall Square, not in spite of going independent, but because they’ve gone independent. Kendall landlords have created a neighborhood that’s a better place for everyone — their investors, small entrepreneurs, corporate tenants, residents, and the wider Boston region. So now, in places like the Seaport and Assembly Square and Quincy, the choices are stark: Either follow the Kendall model, or construct corporate neighborhoods that could appear on any airport mall road in the country. Cities are collections of cramped, shared spaces, and urban neighborhoods succeed or fail based on whether this collective space is worth sharing. Commercial drags merge the private market with civic life. In neighborhoods where demand is high and business is good, property values rise, streets are safer, and residents command better city services. Whether it’s Tremont Street in the South End or Massachusetts Avenue in Cambridge, neighborhoods thrive by standing out, offering customers something different, and creating a strong sense of place. And standardized retail chains, by definition, stand in opposition to strong, unique places. Kendall Square hasn’t gone from cultural wasteland to hotspot because it managed to fill empty storefronts with any business. It is humming because neighborhood leaders paid attention to who was filling those empty storefronts. Landlords and city officials came together purposefully to support local, independent businesses, and the response has been astounding. Nineteen independent restaurants have opened in Kendall Square over the past three years; not one has failed. These restaurants now provide the type of dining amenities Kendall’s neighbors and employers long clamored for. Because of their independent nature, they’ve also fostered a strong sense of community and local identity. The key to the turnaround has been a shift in how property owners think about their real estate business. Taken on its own, any one deal with a small, local restaurateur is far riskier and less lucrative than signing on with a deep-pocketed chain. Kendall Square landlords have been able to favor local businesses over boring chains because they’ve reset how they look at their own real-estate values. By charging less for ground-floor retail space, they’ve created destinations that help drive demand, and revenues, on the floors above. At Technology Square, Alexandria Real Estate Equities took less money upfront from Area Four, a coffee bar and pizza shop mashup by Chef Michael Leviton, and Catalyst, a venture by Aujourd’hui alum William Kovel; the two restaurants have helped create a buzz around Kendall, and that buzz has helped the lab and office tenants at Technology Square attract and retain top talent. The value of restaurants “isn’t a couple bucks per square foot [in rent] on the ground floor,” says Jesse Baerkahn, the lawyer who helped drive Kendall’s locals-first retail philosophy. “The value is what it does for the building, and the neighborhood.” By helping make Cambridge into one of the hottest commercial markets in the country, Kendall’s new restaurants have created their own subsidies. Attractive neighborhoods are additive, not competitive. Kendall Square’s emergence doesn’t take away from what’s happening around Harvard or in the South End or Dudley Square or Jamaica Plain; it makes the Boston area, as a whole, a stronger draw for residents and businesses alike. So there’s no reason why developers from Boston to Somerville and Quincy shouldn’t take the Kendall independent-first model and run with it. The only thing they have to lose is bland, cookie-cutter retail space.